Ann Licater has just released a brand new follow up to her opening debut Following the Call, a release which received nomination of Best Native American Album and listing in the top 12 Contemporary Albums in 2007. This first effort began her journey of recognition as a top solo flutist performing on Native American, World and silver alto flutes and had begun the chosen pathway towards her next success. 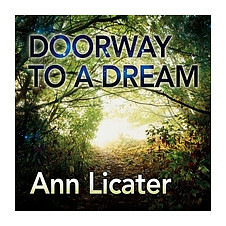 Doorway to a Dream is the 2010 release from Ann Licater that again displays her level of expertise in both traditional and indigenous flutes while accentuating the fine attributes woodwind instruments can produce. The 14 original songs and improvisational compositions this time around however are during collaboration with accompanying musicians and becomes a perfect album discovery for those who appreciate the smooth sounds of tranquil and relaxing music. Ann Licater is well rehearsed in classical silver flutes having began her own journey into Native American & World flutes years ago after listening to the unique sounds indigenous flutes can produce, having studied with master flutist R.Carlos Nakai at the Renaissance of the Native American Flute which nicely reinforces the comprehensive skill level of her already accomplished classical flute studies. Many of the indigenous instruments Ann plays on this album are selected for their unique tonal qualities and include Native American-style, Chinese Rosewood Xiao, Zapotec Triple Clay, Anasazi and Alto flutes. In addition to her recordings, Ann Licater teaches in workshops and during concerts, describes to her audiences the origins for each of the clay and wood instruments featured during her appearances. Doorway to a Dream is a natural contrast to her first solo album by inclusion of recognized artists who incorporate their talents and help expand her original compositions by collaborative instrumentation of Middle Eastern Tar, African udu Coral electric sitar, Edo period Japanese shakuhachi, flugelhorn, acoustic guitar, piano, keyboard and World percussion. Whether you are searching for music with the unique intonation flutes can produce when placed in the hands of an accomplished musician, or simply enjoy the finer sounds produced by music professionals, Doorway to a Dream is a natural choice. The world class musicians accompanying Ann Licater on various songs throughout this album and you are sure to recognize are Jose’ Neto, Jeff Oster, Peter Phippen, David DiLullo, Troy Arnett, William Hoshal and Shambhu. This album was mastered by award winning Engineer Stephen Hart. 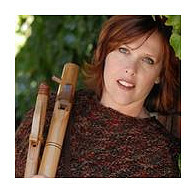 Visit fluteforthesoul.com to sample / purchase or at her CDBaby.com page. Photo courtesy of Greg Crowder.